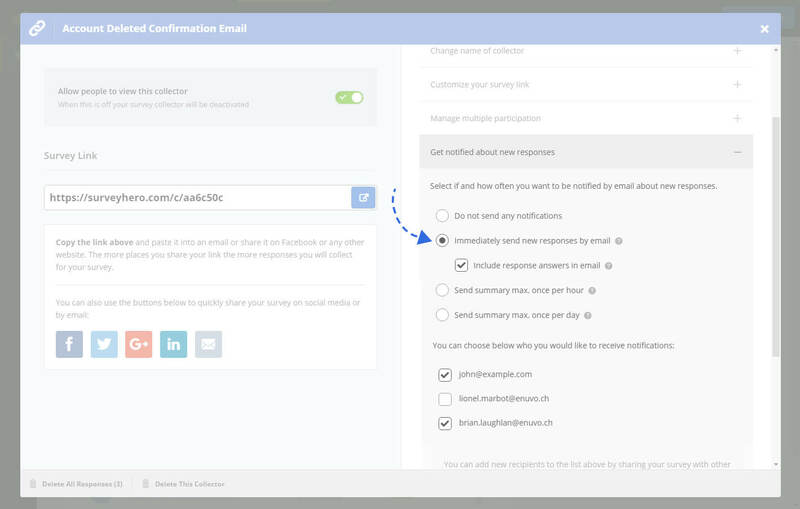 You can define whether you would like to be notified by email about new responses to your online survey. There are two kinds of response notifications, the first is an immediate notification which includes the participant’s answers and the second is an hourly or daily summary of the amount of responses you received. These settings can be set per collector (e.g. per survey link). You can also define multiple email addresses to allow other people to receive the notifications as well. Do not send any notifications You will not receive any notifications from this collector. Immediately send new responses by email You will immediately receive an email whenever a new complete response has been submitted. You can also choose to include all of your participant’s answers directly in the email. Send summary max. once per hour Whenever there are new responses collected through this collector, we will send an email notification about it. However, no more than once per hour. Send summary max. once per day Whenever there are new responses collected through this collector, we will send an email notification about it. However, no more than once per day. If there are no new responses during the chosen time frame (e.g. hourly or daily), no notification will be sent. You will only receive a notification if there is at least one new response. The summary notifications only mention the number of new responses that were collected during the last hour or day. The immediate response notification will include all of the participant’s answers in the email. If you disable this option, we will simply notify you that there is a new response but without adding any details. If you have any questions in your survey which require answers that contain sensitive information, we recommend that you turn off the “include response answers” option. That way the sensitive answers will not be included in the notification emails. 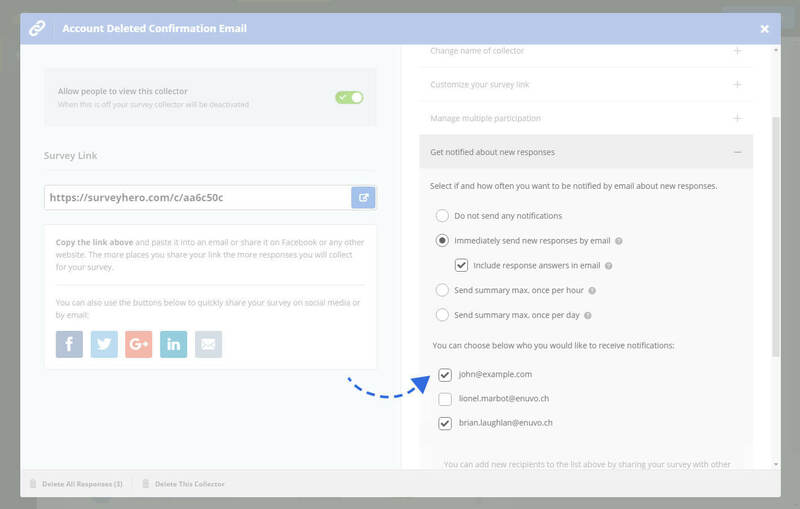 After you have chosen how often you would like to receive the notification emails, you will be able to select which email addresses you would like to send them to. The email addresses that are shown here will be from the people who are a) In your team and b) who you have gave survey access to. If their email address is checked then they will receive the response notifications. You do not have to remove someone from your team to stop them receiving the notifications. Simply just un-check their email address in the collector settings and save. We have a help article which has great information all about managing your teams. You can read more about it here: Everything you need to know about collaborating in teams.